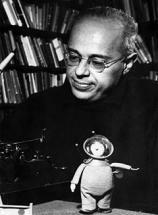 Stanisław Lem (12 September 1921 - 27 March 2006) was a Polish writer of science fiction, philosophy and satire. His books have been translated into 41 languages and have sold over 27 million copies. He is known as the author of the 1961 novel SOLARIS, which has been made into a feature film three times. In 1976 Theodore Sturgeon said that Lem was the most widely read science fiction writer in the world. In 1996, Lem was the recipient of the prestigious Polish national award, the Order of the White Eagle. His works explore philosophical themes; speculation on technology, the nature of intelligence, the impossibility of mutual communication and understanding, despair about human limitations and humanity's place in the universe. They are sometimes presented as fiction, but others are in the form of essays or philosophical books. Translations of his works are difficult due to passages with elaborate word formation, alien or robotic poetry, and puns. He gained international fame for THE CYBERIAD, a series of humorous short stories from a mechanical universe inhabited by robots (who had occasional contacts with biological "slimies" and human "palefaces"), first published in English in 1974. His best-known novels include SOLARIS (1961), HIS MASTER'S VOICE (1968), and the late FIASCO (1987), expressing most strongly his major theme of the futility of humanity's attempts to comprehend the truly alien. SOLARIS was made into a film in 1972 by Russian director Andrei Tarkovsky and won a Special Jury Prize at the Cannes Film Festival in 1972; in 2002, Steven Soderbergh directed a Hollywood remake starring George Clooney. In 1982, with martial law in Poland declared, Lem moved to West Berlin, where he became a fellow of the Institute for Advanced Study, Berlin. After that, he settled in Vienna. He returned to Poland in 1988. In the early 1990s Lem met with a literary scholar and critic Peter Swirski for a series of extensive interviews, published together with other critical materials and translations as A STANISLAW LEM READER (1997). In the book Lem speaks about a range of issues rarely touched on before in any interview. Moreover, the book includes Swirski's translation of Lem's retrospective essay "Thirty Years Later", devoted to Lem's legendary nonfictional treatise Summa Technologiae. During later interviews in 2005, Lem expressed his disappointment with the genre of science fiction and his general pessimism regarding technical progress. He viewed the human body as unsuitable for space travel, held that information technology drowns people in a glut of low-quality information, and considered truly intelligent robots as both undesirable and impossible to construct. Lem died in Kraków on 27 March 2006 at the age of 84 due to heart disease.